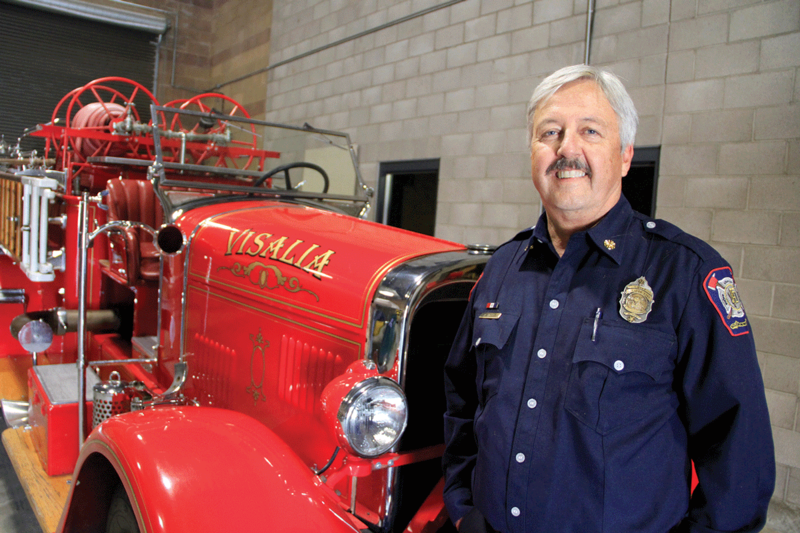 VISALIA – The quaint San Joaquin Valley of sunny California seemed like a paradise to Doug McBee when he agreed to become the next fire chief of the Visalia Fire Department. The Colorado native and outdoorsman was astounded to find a place that was two and a half hours from the sights of Yosemite, the sands of the Central Coast, and the scenery of the sequoias. What he didn’t know and couldn’t have known was that he was relocating to a semi-arid desert on the cusp of the worst drought the state had ever seen which helped fuel the deadliest wildfires in the state and nation’s history. McBee said it was a trying time for him and the department as the drought’s impact was compounded by the lack of resources during the Great Recession. Looking back on McBee’s six years as Visalia’s fire chief, his greatest achievement may be exponentially improving the efficiency of the fire department, because there was not an alternative. Between 2013 and 2019, VFD did not increase the number of firefighters but did see a significant increase in the number of calls. Since 2014, the latest statistics available on the department’s website, VFD’s total calls for service have increased from 14,482 to 15,301. While the number of fires has remained relatively consistent, averaging between 500 and 600 calls and about 150-160 structure fires, medical/rescue calls (heart attacks, traffic injuries, extrications from vehicles) have increased by more than 2,000 calls per year. During that time, VFD has operated with 75 sworn firefighters and seven civilian support positions. That equates to one battalion chief and 21 firefighters on seven apparatus responding to 40 calls per day. McBee said adding new firefighters is difficult because the increase in medical aides means there is a greater need for firefighters/paramedics instead of more traditional firefighters. VFD also houses one of 150 California Office of Emergency Services (Cal OES) engines in the state. Under the California Fire Assistance Agreement (CFAA), Cal OES engines that respond to state wildfires get 100% reimbursement for their personnel and equipment, including a surcharge for administrative and vehicle support. In December, McBee reported the city council that VFD has participated in 50 strike team deployments to wildland fires throughout the state in the last five years. In order to allow the same number of firefighters to respond to more calls, McBee oversaw the modernization of the department. During his tenure, the city of Visalia constructed Fire Station 53 at Atwood and Walnut, the Visalia Emergency Communication Center that houses the Dispatch Center, the Emergency Operations Center and Fire Administration. He has been involved with the purchase of five new fire engines, a new ladder/quint aerial truck and a new Air/Light Unit Truck to better protect citizens and firefighters. McBee also took a regional leadership role as an active member of the International Fire Chief’s Association, California Fire Chiefs Association, California Municipal League of Fire Chiefs, Central Valley Fire Chiefs Association and past president of the Tulare Co / Kings Co Fire Chief Association. McBee’s retirement just happens to coincide with the department’s 150th anniversary. McBee said VFD is one of California’s 10 oldest fire departments and the oldest fire department in the Valley. The department takes its history seriously. A keystone in the Visalia Convention Center marks the location of the first fire station at Court Street and Acequia Avenue and can point to a fully restored 1937 Seagate engine it proudly presents during parades and, more impressive, an 1869 Silsby Steamer. The steam-driven water pumper was the first piece of equipment purchased by the newly formed Visalia Fire Department after a bucket brigade was unable to stop a downtown hotel from burning down that year. Another fun fact, McBee said, is that the Silsby was actually slated for the City of Eureka and another was supposed to go to Visalia. The orders were mixed up and VFD’s most historic piece of equipment bears the name of a city 500 miles north. Prior to coming to Visalia, he served as the Executive Director of the Colorado Fire Chiefs Association, Fire Chief and CEO of the West Metro Fire Protection District in the greater Denver area and a Chief Officer in the Fire Department for the City of Aurora, Colorado. He started his career in the fire service with Aurora in April of 1977 and will retire on May 10, 2019 from Visalia after 42 years in fire service.